* Mark Armitage of the CRS iDINO Project Brings in Soft Dinosaur Tissue: Real Science Radio co-host Bob Enyart interviews in studio Cal State Microscope Lab director and Creation Research Society board member Mark Armitage about the original biological tissue in a Triceratops horn. Along with CRS microbiologist Dr. Kevin Anderson, Mark traveled to the Hell Creek Formation in Montana and guided by local fossil expert and museum curator Otis Kline, excavated a huge Triceratops horn, and like at Harvard, and dozens of other universities, broke it open and... guess what... soft tissue! * Come Out Tonight to the Rocky Mountain Creation Fellowship: You're invited to attend the RMCF meeting tonight, Fri., June 8th at 7 p.m. at the Bethlehem Lutheran Chapel at Wadsworth and 21st to hear CRS scientists Danny Faulkner, Jean Lightner, Mike Oard, Kevin Anderson, president Don DeYoung, and Mark Armitage on the iDINO project! UPDATE: About a dozen CRS scientists graciously stayed after the event for more than an hour to answer questions from the large crowd that had such a great time that folks just didn't want to leave. Thanks to RMCF president Ed Boudreaux and Fred Williams, Bill Browning, Tom, Frank, and everyone who made the event such a great success! Coloradans should plan to attend each second Friday! 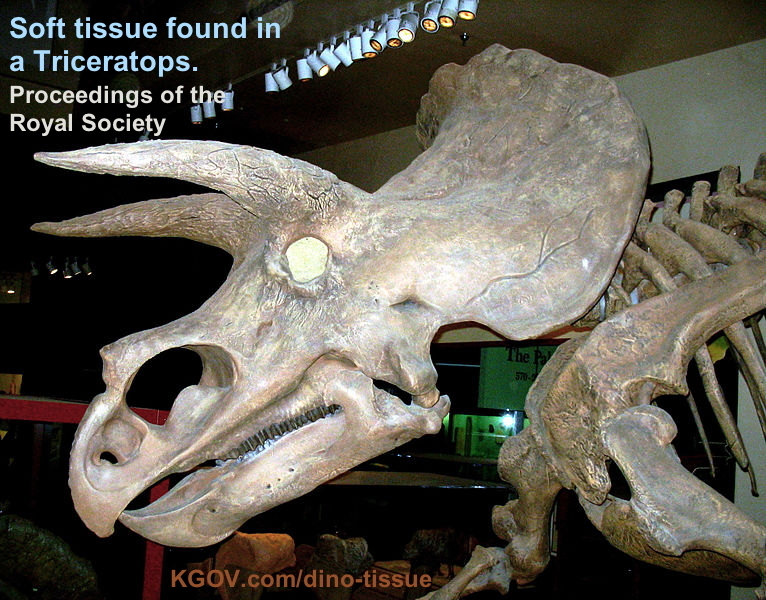 * Armitage Compliments the RSR Dino Soft Tissue Page: Mark Armitage complimented our DinosaurSoftTissue.com listing as the web's most complete catalog of peer-reviewed journal papers confirming the existence of original biological tissue from dinosaurs! * Enjoy More: Click for our other RSR Mark Armitage interviews! * Creation at Denver Bible Church on June 10: Pastor Bob invites you to visit DBC at 7180 Oak Street in Arvada especially this morning at 10:50 a.m. to worship with us and then to hear the president of the Creation Research Society, Dr. Don DeYoung! Today’s Resource: Get the fabulous Carl Werner DVD Living Fossils and his great prequel, Evolution: The Grand Experiment! And have you browsed through our Science Department in the KGOV Store? Check out especially Walt Brown’s In the Beginning and Bob’s interviews with this great scientist in Walt Brown Week! You’ll also love Bob Enyart’s Age of the Earth Debate and the superb kids' radio programming, Jonathan Park: The Adventure Begins! We offer a 30-day money back guarantee on all purchases.